Wing span: 1 1/2 - 2 3/8 inches (3.8 - 6 cm). Identification: Tip of forewing square-shaped. Upperside forewing of male white with yellow basal area; often with vertical black bar at wing edge. Underside of hindwing has raised veins and satin sheen. 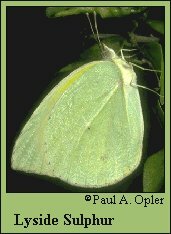 Females occur in both yellow and white forms. Both sexes are extremely variable. Life history: Caterpillars hide in bark crevices during the day, and come out to feed at night. Adults periodically make huge migrations. Flight: Throughout the year in South Texas, April-August in Florida and to the north and east. Caterpillar hosts: Plants in the Zygophyllaceae family: Lignum vitae (Guaiacum sanctum) in southern Florida and Porliera angustifolia in Texas. Adult food: Flowers of black mangrove and shepherd's needle have been used as nectar sources in southern Florida. Habitat: Tropical scrub lowlands and seasonally dry forests. Range: Venezuela north to southern Texas, where it occurs in great numbers. Rare in southern Florida; strays to Colorado, Nebraska, Kentucky, and other states.